We are a prominent Anhydrous Ammonia Gas Manufacturer, Exporter and Supplier based in India. Our production unit is well equipped with all the machineries with latest technology required for processing and storing Anhydrous Ammonia Gas. The plant has a cylinder filling capacity of 7.5 M.T. of Anhydrous Ammonia. Anhydrous Ammonia Gas can be supplied in our Returnable Cylinders 40 kgs. & 50 Kgs. Net capacity per container is approx. 150 cylinders. We supply cylinders which have absolutely no problem of â��Water in Ammoniaâ��. 40 Kgs. 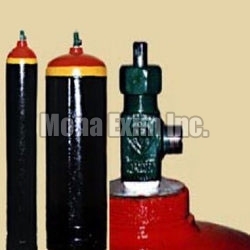 Net capacity cylinders : This type of cylinder is seamless mild steeled as per BSS 401 specifications. These cylinders have their origin in Czechoslovakian. The Tare weight is 90 kgs approximately. 50 Kgs. Net capacity cylinders : This is a three piece welded mild steel cylinder as per IS7680 Specification. This cylinder has an Indian origin which is manufactured by Bharat Pumps and Compressors Ltd. and Jai Maruthi Gas Cylinders Ltd.